The drug is the dried or fresh twig or leaf of Fortunearia sinensis Rehd. et wils. (Family Hamamelidaceae), growing in forests on mountain slopes or in crevices, and distributed in Shaanxi, Henan, Anhui, Jiangsu, Zhejiang, Jiangxi, Hubei and Sichuan province. Bitter, astringent, neutral; kidney meridian entered. 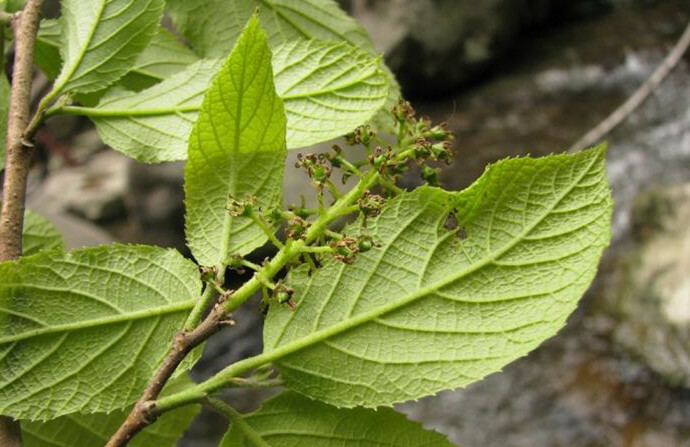 Twig or leaf is used to refresh qi and promote the tissue regeneration, as hemostatic, for the treatment of deficiency of qi, internal injury caused by overstrain, externally for traumatic bleeding.